Norwood Health Center is located on a grassy, partly wooded 20 acre campus in the heart of Marshfield, Wisconsin. 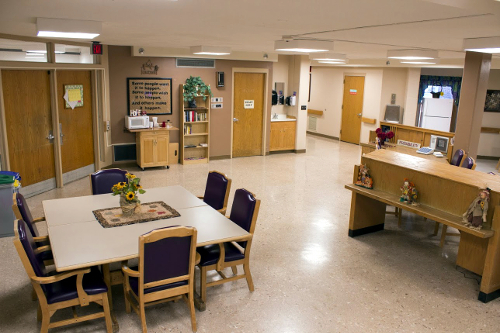 One of the specialty units located on the campus is our Brain Injury Rehabilitation Program, Pathways. Pathways has been in operation since 2009, and is a state certified, post-acute, traumatic brain injury rehabilitation program. The purpose of Pathways is to provide rehab services to individuals, aged 18 to 64, who have sustained a brain injury, in order to increase independence and enrich their quality of life. The goal of the Pathways Unit is to help the participant return home or to the most appropriate community setting. In order to support this goal, our program offers intensive therapeutic, outcome-focused rehabilitation utilizing an Interdisciplinary Team approach. We meet the individual needs of the person through comprehensive assessment that is focused on identified expectations and outcomes. Throughout the entire program, we encourage the active participation of the person and family and strive to provide for choices of the individual served. Our focus is to help the participant return to their community by using a participant/family centered and result oriented approach. During their time on Pathways, our participants have access to a full size gym, weight lifting equipment, an occupational therapy kitchen, church services, sensory integration room and a home-like environment. During and after the physical recovery from a brain injury, a person may receive various tests that help determine what parts of the brain have been affected. Sometimes this testing is conducted by a neuropsychologist or a clinical evaluator who is experienced in brain injury screening. If the need for rehabilitation is evident, then specific rehabilitation services will be recommended. The actual length of the rehabilitation process varies according to the person and to the severity of their injury. Some people may only require a few weeks or months of rehabilitation, and others may require years or even lifelong rehabilitation. While most medical professionals and brain injury experts agree that rehabilitation should begin as early as possible following a brain injury, it is not uncommon to begin rehabilitation months after the injury event. With the help of specialized rehabilitation, anyone with a brain injury can continue to make improvements in his or her life. Patients are generally required to be on Medicaid, but some private and commercial insurances are accepted. For or inquiries or to make a referral, please call the Pathways Social Worker at 715-384-2188 x 3236. The Pathways program focuses on functionally based therapies to address cognitive and life skill development. The program establishes positive behavioral support to increase healthy, adaptive behaviors and address unsafe behaviors which interfere with successful rehabilitation outcomes. Adults are assisted to maximize their independence at home and to facilitate a potential successful return to their community, work, or productive activity. When a participant is first admitted, there will be a rigorous evaluation that includes assessment by a multi-disciplinary team. The team includes a Primary Care Practitioner, Nurse, Neuropsychologist, Physical Therapist, Occupational Therapist, Speech Therapist, Activities Coordinator and Social Worker. Nursing Care is primarily focused on assisting participants to achieve their highest level of ability. Our dedicated nursing team consists of Certified Nursing Assistants (CNA) who provide all of the basic cares. Registered Nurses (RN) supervise CNAs, and are responsible for the distribution of medications and performing treatments. A Social Worker collaborates with RNs to coordinate care with other disciplines, as well as ongoing assessment of the residents and evaluation of their care. Nurses and the social worker are available to educate the participant and family about their health problems and treatment plan. This education is essential to enable a participant to return home and resume their usual pattern of living if that goal is possible. Medical Services: A physician is on site or on call full time and on an emergency basis to address the medical needs of residents. Under the direction of the physician, residents receive frequent visits during times of acute illness as well as scheduled intermittent visits for chronic problems. Therapy services: Norwood has selected Greenfield Rehabilitation Agency to offer comprehensive Physical, Occupational and Speech therapy services for program participants. They are dedicated to helping residents function at their highest ability level and improve their quality of life. Individualized treatment programs identify and focus on specific impairments before they result in significant changes or declines. Greenfield Rehab is committed to excellent patient outcomes, quality care and satisfaction. Greenfield ensures this by collaborating with the treatment team including the participant, their family, their physician and Norwood staff. Participants will also have the opportunity to participate in daily scheduled as well as non-scheduled activities, on and off the unit.